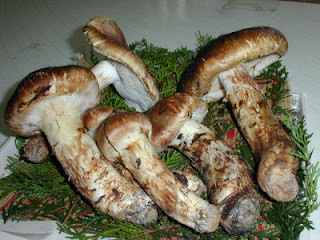 Top three hit products of 2010 in North Korea are Matsutake mushrooms as shown below (the most favoured mushroom in Japan), skinny Jeans, and manure (or night soil). The reasons behind their popularity are quite simple. Because international community has tightened economic sanctions against North Korea to punish the communist state, they lost overseas customers as far as top two hits, Matsutake mushrooms and skinny jeans are concerned. As Japan stopped importing Matsutake mushrooms as part of its economic sanction, North Korea lost customers of Matsutake mushrooms, one of the most valued export items to Japan. Skinny jeans manufactured in North Korea found no overseas customers this year. Thus, skinny jeans has became so popular among the North Korean women who are in fact prohibited to wear pants at all. Since those living in the apartments cannot find any means to store their night soil, they have to depend upon night soil sold at markets for growing their own vegetables. North Korea can no longer enjoy use of free chemical fertilizers that they used to secure as a part of foreign assistance. http://bit.ly/aTR5uH See the photo depicting a market in Seoul 100 years ago. A Japanese woman blogger discusses how Koreans utilize night soil (since it is so disgusting, I don't want to describe it at all. ).